MSNBC’S ELDER STATESMAN AL SHARPTON UNLEASHED: A HISTORY OF VILE BIGOTED STATEMENTS…….. – The Tundra Tabloids……. 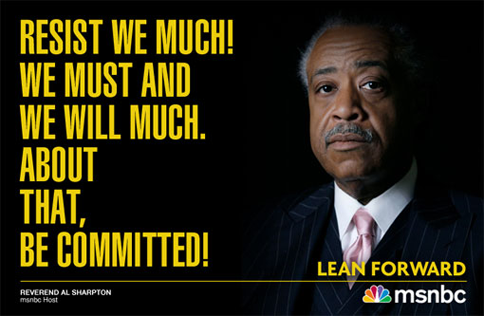 MSNBC’S ELDER STATESMAN AL SHARPTON UNLEASHED: A HISTORY OF VILE BIGOTED STATEMENTS…….. The hypocrisy of the left reeks to high heaven. Breitbart.com: To provide a stark contrast to the relatively tame remarks Rush Limbaugh made on the air that have been widely condemned by organizations such as Media Matters and the leftist media, Breitbart.com has compiled the insults and characterizations Al Sharpton — the man who NBC News’ President Phil Griffin called an “elder statesmen” — has made in his career. Next Post Next Post WOMAN IN BURKA SURROUNDED BY POLICE, THOUGHT TO HAVE BEEN CARRYING BOMB UNDER GETUP…….